If you create a user account, you can add your own review of this DVD The silence has been broken... "Thrilling" (Time), "absorbing" (The Wall Street Journal), and "entertaining" (Newsday), this follow-up to The Silence of the Lambs is an "audacious success" (Us Weekly)! 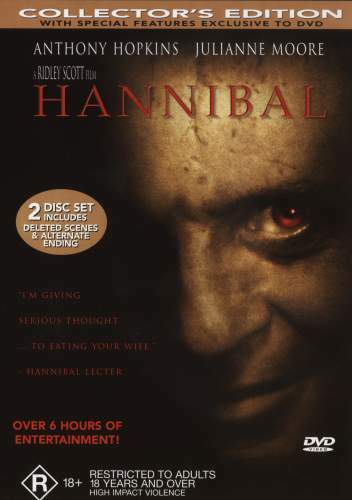 Anthony Hopkins is "perverse perfection" (Rolling Stone) in his return to the role of Dr. Hannibal Lecter, the sophisticated killer who comes out of hiding to draw FBI agent Clarice Starling (Julianne Moore) into a high-stakes battle that will test her strength, cunning...and loyalty. Drenched in terror, suspense and shocking visual effects, Hannibal is "as compelling a film as you will ever see" (Joel Siegel, "Good Morning America")!